In Collecting And Cremating Ebola Victims, A Grim Public Service Stephen Rowden, a volunteer with Doctors Without Borders, just returned from Liberia. In just four weeks, he supervised the removal and disposal of over 330 bodies of Ebola victims. People are keeping their distance from Stephen Rowden. He just returned to the U.K. this week from Liberia. It was his first posting with Doctors Without Borders, and Rowden was charged with a grim task: managing teams of body collectors in Monrovia, the capital of Liberia. He was surprised by the scale of the job: They collected 10 to 25 bodies a day. Someone had to do it. In a month of work there, Rowden says, his team collected and disposed of over 330 bodies. Most of them came from the Ebola treatment wards, but some were collected from homes. "Unfortunately, they weren't that aware of the conditions that the government had imposed on the removal and disposal of bodies, so it was quite a shock when we advised them that the body would be taken for cremation, and burial was not permissible," says Rowden. Liberia's government has effectively banned traditional burial practices in which families wash and embrace their dead. Instead, the teams quickly collect the corpses and transport them to a Hindu crematorium, where an open air pyre is stacked up with wood each day, and lit with kerosene each night. The facility is one of the only ones equipped to do cremations in a country where burial is the primary way of sending off the dead. 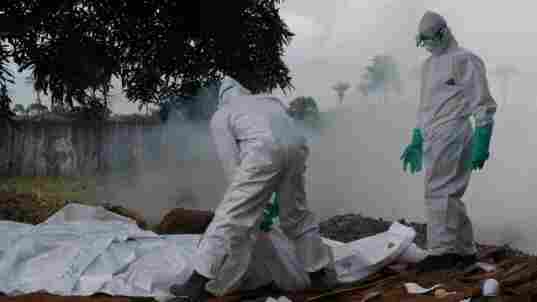 The families of Ebola victims don't get to recover their loved ones' ashes. Despite the disruption of traditional practices, Rowden says that the people he worked with felt a satisfaction at their grim and counter-cultural job. "They did see it very much as a role of helping the Liberian people as a whole," he says. "I feel very privileged to have undertaken the work I did. A lot of it I'm still working through — my feelings, my thoughts," Rowden says. "But would I consider going back? Yes, I would." During his last week, Rowden says Doctors Without Borders imported two medical waste incinerators from Europe to help with disposal. Back at home in Danbury, England, Rowden faces the stigma many others have experienced in this Ebola epidemic. We asked him to speak to us from a radio studio near his home. The staff there said no. They were concerned about his exposure to Ebola. We called him at home instead. Rowden says none of the 36 people he managed in Liberia have shown any symptoms of Ebola.